The North Monterey County Condors return to defend their 2002 title and seek their 7th title in the last 10 years. They are currently ranked 1st in CCS and 1st in State DIII. They have enjoyed a very succesful 2003 campaign with an undefeated dual meet record, victories at Stanford and Clovis, and runner-up showings at Earlybird and Ed-Sias. They have recently been plagued by illness and freak non-running injuries but now seem to be over those and on an up-swing. They look to have a great championship run in November. Look for them to put all seven scorers in the top 10. Last year they placed 7 in the top 8! The Condors are led by Nathan Huerta (11) who has enjoyed an amazing breakthrough season. Joining the elite California runners, Nathan has posted several victories at large invitationals as well as top finishes among the best California has to offer. Nathan has dipped under 15:00 for 3 miles and has mentioned that he would like to take a shot at Jeremy Mineau’s 15:21 course record at Toro Park. Keli Parker (11), the Defending MBL Champ, will give the Condors a solid 1-2 punch followed by an army of experienced pack runners that have all ran in the 16:00’s at Toro. They include, Jose "Pelon" Garcia (11), Danny Tapia (12), Eric Padilla (12), Jose Garcia (12), and up-and-coming Ivan Alfaro (10). Seaside very well may be the most improved team in the league. The have a 4-1 dual meet record and have had impressive showings at many invitationals. They are currently ranked 4th in CCS DIII. They are led by Adalberto Corres (11) who has run the table in dual meet competitions and has run impressive times in invitationals. Look for him to be fighting for a top 3 finish. He will get some help from one of the most improved runners in the league, sophomore Steven Thompson. Steven has put in major miles in the last year and has seen his hard work pay off. Seaside also wins the "toughest course award" for 2003 with the famous "beach"! Alvarez looks to be in the run for a top 3 automatic CCS qualifying finish with their 3-2 dual meet record. They are led by Chris Toler (11) that has run 17:34 at Toro this year. Monterey comes in at 2-3 and is led by senior Roberto Lopez with a 17:30 Toro PR. The Toreadores will have to upset Alvarez or Seaside to advance to CCS. Alisal has some good up-front running in sophomore Enrique Lopez with his 17:05 Toro PR but needs to shore up some depth concerns if they would like to make it to CCS. They also feature senior Liu Ibarra that has laid low this season but could surprise. Monte Vista Christian represents the league’s only DIV team and therefore will represent the league at CCS with an automatic qualifying spot. They are led by hard working Chance Carothers (11) who has paced the team throughout. In the JV and Frosh/Soph divisions, North Monterey County has run the table in meets this year and look to do very well with their large squad and crushing depth. 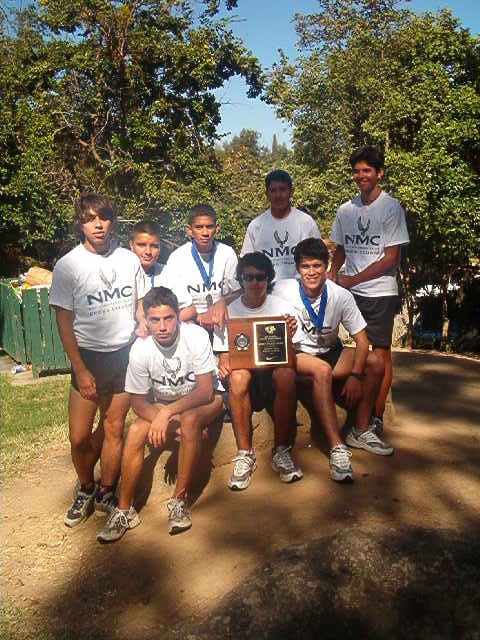 In fact, the JV team features Enoch Trujillo (11) and Mike Lucio (12) that ran on their state meet team in 2002. The North Monterey County girls also are looking to defend their 2002 title and should do it in fine style. They are currently ranked 6th in CCS in the very competitive DIII. They feature a very strong pack that has interchanged throughout the year. They are 5-0 in dual meets and have had impressive showings at many invitationals. Look for them to be led by one of several fine runners including Grecia Garcia (12). The senior is looking to dip under 20:00 at Toro. She comes in with a 20:37 Toro PR. Jessica Sanchez (12) has run 20:51 at Toro and could also challenge for the win. Last year the Condors put 5 girls in the top 8. Look for much the same this year. Alisal has looked great on the girls side and comes in at 4-1 and looking to make some noise with their young squad. They are ranked 8th in CCS DII. They are led by freshman Adeline Sanchez that has ran 21:20 at Toro. Seaside is 3-2 and is looking for that coveted top 3 finish that will get them to CCS. They are led by Jill Scott (12) and Maddy Carriles (11). Alvarez is 2-3 and comes in ranked #9 in CCS DII. They are led by Arlene Diaz Leal with her 21:29 Toro PR. Monterey has senior Athena Pierre leading them. She has a 22:41 Toro PR. They come in with a 1-4 record. Monte Vista Christian led by senior Allina Hightower and sophomore Lauren Muir with five finishers will once again represent the MBL at CCS in DIV. In the JV division, North Monterey County comes in at 5-0 and has crushing depth that should be enough for a convincing victory. Good luck to all runners, it should be a great meet!! Races begin at 10:00 AM.